We offer Material Handling Conveyors that are available in various designs and performance configurations. 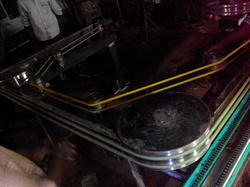 Our conveyors have hinged belt to effectively handle various chips, turnings and other metal scraps. We tailor our conveyors as per the volume of chips being conveyed and the work area layout. By streamlining the conveyor design, we have simplified the maintenance process of our conveyors. We are also proud to state that we are one of the few counted names to offer Vibrating Conveyors that consists of a horizontal tray made of mild steel or stainless steel. This horizontal tray is fixed to the frame, and the vibration is produced by two special unbalance motors which are fixed on either sides of the tray. 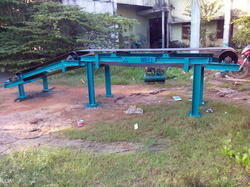 We offer wide range of vibrating equipments like conveyor and feeders. The oscillating motion of the trough is achieved through specially designed inclined arms and an eccentric shaft driven by a motor through V-belts. The eccentric shaft is mounted on anti friction bearings and has V-pulleys at both ends with weights on them to counteract the unbalancing force. The rotation of the eccentric shaft provides a forward and backward motion to a connecting arm attached to the trough through a rubberized pin. The trough motion is predominantly horizontal with some vertical component, which causes it to oscillate with a pattern conductive to conveying material. All components including drive motor are mounted on a rigidly constructed base frame. Hot and abrasive materials can be handled Cooling, drying and de-watering operation can be done during transport. Units can be covered and made dust tightMoves high volumes of material with low horsepower requirements Levels and orients material as it is conveyed, reducing surges to downstream equipment. 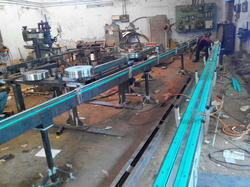 They are built in 10 foot long sections which are bolted together to makeup a conveyor of the required length. Odd length sections are available to use at the ends of the conveyor when the length is not a multiple of 10 feet. Counter balanced design provides an extremely smooth running conveyor with reduced foundation and support structure requirements. The chain, running in the conveyor trough driven by a three-phase geared motor. They were equipped with permanent magnets and attracted by the magnets. The tightly sealed conveyor surface perfectly encloses the moving parts, thus allowing the conveyor to be used under difficult operating conditions. This design also guarantees low-wear operation and minimum maintenance. Chips are removed without interrupting production. Chips and coolant are separated automatically. Our magnetic chip conveyors are used at machine tools, nibbling machines , punching and washing machines, for conveying small parts and for scrap disposal. We are a trusted name in manufacturing, supplying and exporting an array of belt conveyors employed in modern material handling systems. These are very strong and durable in nature. Their cost effective prices and qualitative features have earned a number of clients to its credit. These are also used for increase and decrease in conveyor path. MAGWELL Can conveyor products have a wide variety of types and are widely used in the electric power, Food, steel, chemical, port, grain and other industries. The belt conveyer can be installed horizontally or aslope to meet the needs of different transferring requirements. the working environment temperature is lower than 40 °C. It is widely used in Food mining ,metallurgy ,coal and other industries ,the belt conveyor can be used to transfer bulk materials or material in pieces ,according to different transferring requirements ,the transferring system can be of only one belt conveyor or consists of several conveyors ,or combined with other transferring equipments. Magnet Roll offered comprises flexible magnet that can be made available by us in thickness choices of 0.30mm to 10mm, widths of up to 600mm as well as in lengths of up to 30M. Further, these can be provides with PVC film lamination support. Some of its features include support making of various types of magnetic products; glossy/matt finish; PP film to protect the printing; can be provided with/without printing sticker support; used in production of different magnetic products like magnetic bookmarks and magnetic writing boards; magnetic puzzles, magnetic dress-up kits, magnetic advertising gifts and others. Belt Conveyors for recycle unit offered comes designed and developed using latest technology support and come in superior grade rubber finish. These conveyors provide for perfect material handling support and can also be made available in PU material based belt finish. Some of its features include available in custom lengths and widths; food grade material; allows for smooth running; allows for easy and convenient installation support; low maintenance costs; manual or automatic motor support; smooth belt surface; come with support of side guard. Can Conveyors offered comprise high performance flip-flop vibratory screens that combine two motions for creating dual vibration movement. Providing for highly effective work performance, the equipment is highly effective and is proven to be effective in screening all type of waste material. Some of its features include low maintenance and operating costs; compact and modular construction finish; single or multi deck type options; suitable for use in areas like sand & crushed stone, limestone & dolomite, municipal solid waste, bio-solids and others. Magnetic Can Conveyor provided by us are high frequency reciprocating machine capable of conveying bulk materials between various processes. These electromagnetic vibrating feeders can handle all types of material irrespective of their nature like hot, damp etc. These can be used across various processes like sprinkling, weighing, mixing etc. These are supplied with base mounted, over hanging and combined single magnet drive. We are engaged in manufacturing, supplying and exporting a wide range of Screw Conveyors. Our highly premium quality screw conveyors are ideal to carry various light weight packages. Our screw conveyors are developed as per quality guidelines to withstand adverse weather conditions.